The CRKT Ripple 2 is a classic gentleman’s folder knife with high quality materials and some of the smoothest opening action on a folder/flipper we have seen. It uses the IKBS system. This Ken Onion designed knife has been recently updated for the year 2013 and the new variations are the K401GXP and K401BXP. The BXP is bronze, the GXP is grey. This new style is just a little bit longer than the original 400 series. They still have the stainless steel handles with a titanium nitride finish, although the pattern on the new version is a bit “bigger”. I think it is a definite upgrade in the look. If you are looking for an upscale flipper knife, the new CRKT Ripple 2 knives are definitely a series to check out. Watch out over the next few weeks, we are expecting the new variations of the 405 series to be showing up soon. Here is a quick video review on the upcoming CRKT Swindle. Looking forward to having this knife in stock–it is excellent. CRKT Hissatsu 2907 Video Review. Good Stuff. The CRKT Hissatsu is a fixed blade knife series that has three variations. You can also get the Hissatsu in a folder or spring assist model but specifically I will review the fixed blade edition. Similar in some ways to the much more expensive Hisshou knife that is also a James Williams design, the Hissatsu is relatively inexpensive. At just $79.95, you can pick one up without breaking the bank. Here are the things I really like about this knife. Designed as a fighting knife after a legendary blade shape by Takeda Shingen, this knife is built to give you maximum penetration. It also gives you slashing capabilities. The thin profile means you can carry it into tactical situations as a secondary weapon for close quarters combat. The handle has an Oyatsubo, which is the traditional name for the node on one side–which means whatever the conditions, you will know which way the blade is facing by the feel of the handle. It has a great injection molded glass filled nylon sheath that has multiple carry options. If you are looking for a CQC knife that can be carried easily and is built for performance, the Hissatsu is definitely a knife to consider. You can pick it up with an all black blade, a satin finish blade, or a desert tan blade and handle. Ken Onion has designed some pretty fantastic knives through the years. 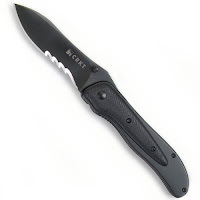 Recently, he and CRKT released the Ripple 2 knife. This manual folder has a lot going for it. It is built on a proprietary ball bearing system that creates a nearly frictionless glide for the knife blade as it opens. You pull the flipper with your finger and the blade just whips right open. This knife isn’t a spring assisted, but it sure opens as good as one. It stays closed through a detent system with the bearings. So it has a positive lock. Then, when you flip it, out comes the blade and just keeps going until it snaps into place–open. One other thing I really like about this knife is the CNC machined handles. You can get it in either a blue or charcoal color–but it is the feel of the handle I like best. Made with a whole ton of texture, the handle gives you a nice solid grip. This is a great pocket knife for EDC. CRKT makes some really great spring assisted knives. 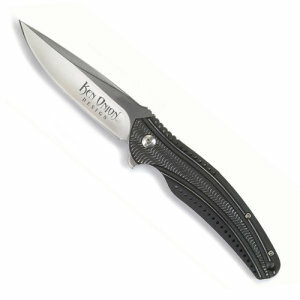 Most of their knives use the Outburst technology, which is their name for their proprietary spring system. It is good. Real good. The Notorious, designed by McGinnis who is a student at NC State University, is a great new addition to CRKT’s line of spring assist knives. This knife has a great blade shape, a very comfortable handle, and it works like a charm.